PT. Destar Rahayu, a development company based in Bali, engaged The GreenAsia Group to undertake a series of Integrative Design Process charrettes to assist in ensuring the long term sustainable development of its 1,014 hectare property in Gunung Salak, Tabanan. As the first step in this process, TGAG organised a two-day discovery or “Scoping Charrette” in December 2013 to identify opportunities, discuss the process of development, as well as organise and develop a recommended scope of work for the property. 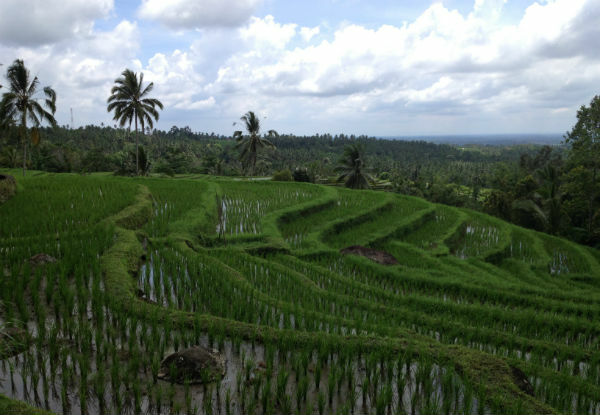 It is essential to ensure that stakeholders consider suitable recommendations for sustainable development of the land, without compromising the economics of the project, or the heritage and cultural beliefs of the current Balinese villagers. Gunung Salak is an agricultural mountain area, 420 metres above sea level, currently growing rice, coffee, cocoa, patchouli, clove and coconut. A total of 1,678 villagers live in 552 families, spread across five villages. Following outreach meetings in 2013, the transfer of the land to PT Destar Rahayu was finalised in November 2013. The proposed master-plan for the site includes organic farming, with a focus on expansion of the range of agricultural crops to increase quality and productivity levels. The resort development consists of Upper Luxury, Luxury and Top Tier, with residential components for all three developments, catering also to the Silver Society. Healthcare facilities will serve both the local villages and guests, and the inclusion of School for Life Centres of Excellence will fulfil educational needs. The whole site is to be seen as a Learning Centre for Agriculture and Sustainability. These site improvements require investment in natural resource protection, responsible resource management, associated infrastructure (especially including efficient modes of transportation), and support for the well-being of the communities on the site. Participants identified broad performance goals and potential strategies to optimise the developer’s return on investment (ROI). They further looked at governance being of primary importance to build consensus and commitment among all stakeholders, including both developers and local villages, for the proposed strategies and their inclusion in the project. Charrette participants, including International Associates Huston Eubank, Swapan Mehra, Shobana Peers, Dr. Philip Pollard and Prof. David Strong, alongside the local Singapore team, spent the two days prior to the charrette visiting the land to familiarise themselves with site constraints and opportunities. The following two days looked at the vision for financial profitability of the development, at the same time focussing on the preservation of environmental and social equity. The development of a model for tourism that could be successful and self-replicating was seen as essential. A further day was spent prioritising goals. Prior to the next charrette, planned for mid-2014, it is essential that a number of feasibility studies be undertaken, acknowledging that development of the business plan for the property requires in-depth research. Before any decisions can be made on site development, current loads on resources must be determined, and feasibility studies on the various elements of the development carried out to weigh the socio-economic-environmental costs and benefits of investments. The GreenAsia Group will assist in the identification of appropriate experts and the commissioning of these studies. The results of each feasibility study will be carefully coordinated and integrated with the studies of other aspects of the project to ensure that holistic approaches are identified and analysed, and synergies are optimized.